Preheat oven to 400 degrees-Convection, if you have it. Line baking sheet with a sheet of parchment paper. 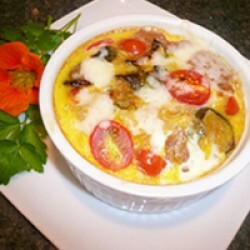 Place zucchini, mushrooms, and onion in large bowl. Add the olive oil, 1/2 teaspoon salt, and 1/4 teaspoon pepper. Toss well to coat the vegetables evenly. Place on baking sheet. Roast approximately 15 minutes or until the edges begin to turn golden brown and vegetables are fork tender. Place sliced tomatoes, 1/8 teaspoon salt, and 1/8 teaspoon pepper in the bowl that you tossed the veggies in. Stir to mix well. Set aside. Break eggs and place in large bowl. Add milk, Dijon mustard, and parsley. Whisk until ingredients are well combined. Spray baking dish with non-stick spray. Place the bread in the bottom of the dish. Top with roasted veggies. Top with tomatoes. Gently pour the egg mixture over all. Let sit 10 minutes for bread to absorb egg. Bake in the center of the oven until golden and slightly puffed, approximately 20-25 minutes. Remove from oven. Let stand 5 minutes before cutting.